Your Relevant Tools account comes with a default Contacts database that you can customize or you can define your own database(s). There are many different field types to choose from; there&apos;s a Text Field, Text Area, Pulldown Menu, Checkbox, Radio Button, Integer, Floating Point, Email, URL, Image URL, and Date field type available, just to mention a few. The Text Field is the most commonly used field type and when it is used in a web form the user is allowed to enter a single line of text. So, for example, if you have the Text Fields first name and last name defined in your database and you display the database records on the screen, you have the option of sorting the database on either of these two fields by clicking on the column heading. A Text Area, on the other hand, allows for multiple lines of text to be entered. When a Text Area field is displayed as a result of a database search you will only see the first part of the information that was entered, shown below. To view the all of the information entered, click on the small "v" to the left of the record, shown below. An example of the entire contents of a single database record is shown below. Notice you can now see all of the information that was entered in the Textarea field. Fields defined as field type Email, URL and Image URL enables those fields to be displayed properly, as links on the screen, in the database display. For example, if you have defined a field named website with a field type of URL, you can click on the information in the field and be taken to the website. The Image URL field type generates the code for an image source and allows you to include (display) images from other websites in your database. The Email field type will generate the html code that will open up a window and allow you to type an email message when it is clicked on. Email field type fields also get some extra error checking when the user enters them into a web form; this is to make sure the email address is entered in the proper format. Pulldown Menus, on the other hand, allow you to select an item from a list of of items. 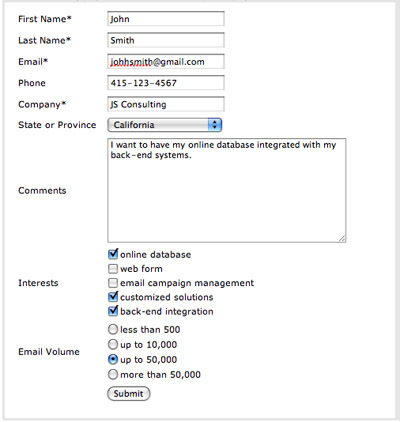 One of the fields defined in the Relevant Tools default Contact database is state. Let&apos;s say fro the sake or argument that you or many of your customers live in Canada and you want to include the Canadian provinces in the list of possible selection items. To begin the process of adding the Canadian provinces to the state field, click on the "DATABASES" button, at the top of the screen. Then, make sure the database you would like to work with, the Contacts database in this case, is the selected database in the Database Selection section, shown below. Finally, click on the "SELECT DATABASE" button. Next, click on the "fields" link located in the Database Functions section, in the right hand column of the screen, shown below. Next, scroll down to the Edit⁄Delete Fields section, in the lower portion of the screen and click on the state field link, as shown below. The Edit or Delete Field, the screen below, will be displayed. This screen allows you to change the Field label from "State" to "State or Province". Change the field label and click on the "EDIT FIELD" button. Next, you will see the current list of states abbreviations, as shown below. At this point, you can either replace them with the Pre-defined list of states and provinces and then click on the "Include List" button or enter your own list of choices for the pulldown menu. Be sure to click on the "Submit Changes" button after making any changes to the list for the pulldown choices. Checkboxes and Radio Buttons are defined in much the same way as pulldown menus where you enter the list of choices. The html code that is generated for your Relevant Tools web form will display the check boxes and radio buttons with the options you have specified. Integer fields are for whole numbers and can be totaled when you display your database. Floating Point fields are used for decimal numbers, such as currency, and can also be totaled. When you specify a field as a date field type and click on the column heading to sort your database the data will be displayed in chronological order by the date instead of alphabetic or numeric order. In addition to the common field types, Relevant Tools databases can contain complex fields. Complex fields can be used to link to other databases or dynamically generate links using data from the current record. If you have special requirements, ask us for more information as complex fields may be able to implement your solution. © 2015-2018 Relevant Blue LLC All Rights Reserved.